Have you ever wondered what it feels like to be in a completely different world? It must be a surreal experience; to move and breathe differently, and to see things that you never thought existed. But you don’t have to be an astronaut to have such an experience. You can simply try deep sea diving. For each diver, the first time is always unforgettable. It’s a revelation, a discovery of a completely new world unlike anything they’ve ever seen before. You’ll learn how to breathe differently. Breathing through a scuba regulator is not like breathing normally on land. You’ll need to learn how to exhale fully after each breath you take, or else you’ll hyperventilate. Movement is not as free. You’re probably old enough to know that it’s much more difficult to move through water than to move through air or even through water near the surface. But being able to actually do it for the first time will still take you by surprise. When you dive for the first time, you’ll need to learn how to make controlled yet relaxed movements. If you don’t, you’ll tire yourself out in no time. You don’t feel your weight. It’s almost like flying. It will feel as if you’re able to break-free from everything – gravity and even your everyday concerns. Under water, you can forget all your worldly problems. You won’t remember most of your classroom lessons. 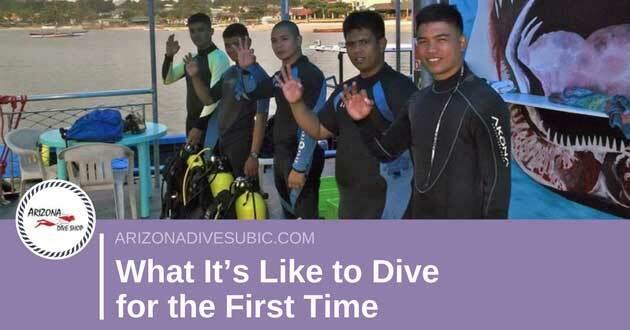 Diving for the first time will emphasize the clear difference between theoretical knowledge and practical experience. It’s very common to forget the skills you learned when you were taught the various aspects of diving in a classroom or in a swimming pool. You may have to go to your instructor to remind you of what to do, but this is normal. The deep is not silent at all. Maybe later you’ll be able to tune out the sounds you make while you breathe underwater, but on your first dive you’ll notice that it’s surprisingly noisy down there. It’s a different world. What you’ll see underwater is simply different than what you see on land. You’ll realize that sunken ships don’t actually look like junk. They have this eerie vibe that pulls you in and makes you imagine what it was like they were still operational. In addition, the underwater caves hold various wonders too. Plants come in explosions of beautiful colors, and the sea animals come in all shapes and sizes. Even your vision is different, as you have no peripheral vision underwater and objects appear closer than they really are. There are some “firsts” that people simply cannot forget, like the first time you ate an exotic dish, the first time you saw a groundbreaking film, or the first time you read a book that totally changed your perspective. Add all those feelings, and you can begin to describe what it’s like to dive for the very first time.